News :: Engine Room Recordings and Tijuana Gift Shop presents a Northside Festival showcase! For the second year in a row Engine Room will present a showcase for The L Magazine’s Northside Festival. Helping us organize the show this year, which is taking place again at Public Assembly, is Tijuana Gift Shop and our media sponsor is the great folks at Green Shoelace. 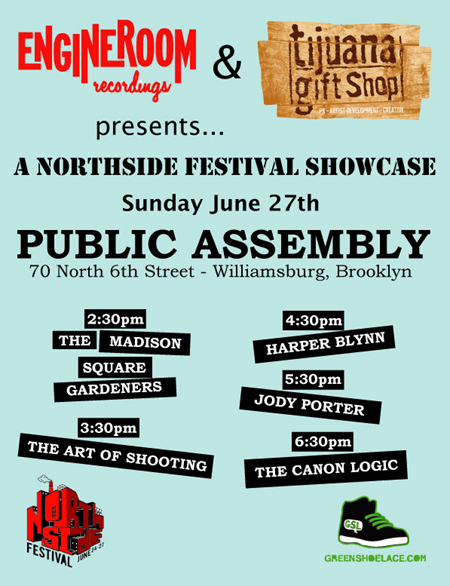 Doors are at 2pm and Madison Square Gardeners kicks us off at 2:30pm, with Harper Blynn, Jody Porter, The Art of Shooting and The Canon Logic also performing….schedule with times below. Tickets are just $5 or “free” to Northside Fest badge holders, which cost $50 and can be purchased in advance here. Oh and the show is this Sunday! !